Here's an ad for the gold YUBA Sawsmith, made in Cincinnati Ohio. I noticed some time back that my Magna Sawsmith has the single word "Sawsmith" all over it, yet my Yuba units both say "Saw Smith". What's up with that? 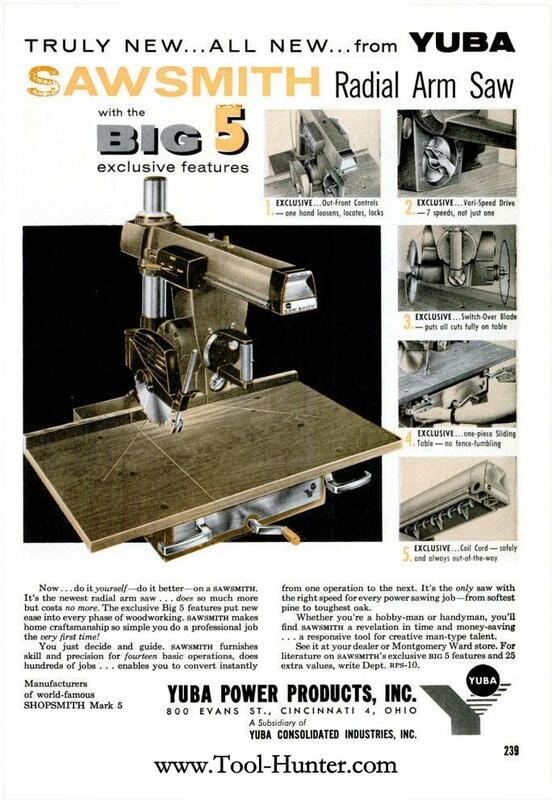 A quick visit to the Trademark office web site uncovered that the name "Sawsmith" was not a registered trademark, but the words "Saw Smith" are a word mark that was first used in commerce in 1960 by Yuba Power Products Inc. of Cincinnati Ohio and was officially registered on October 24, 1961. The word mark was later assigned to Shopsmith Inc. and is a live Trademark.